The story of the immigration and absorption of Ethiopian Jews in Israel epitomises the best and the worst of Israeli society. True to its Zionist dream of being a haven for Jews, the Jewish state embarked on risky and expensive rescue operations in the 1980s and 1990s. These brought tens of thousands of Jews from remote parts of Ethiopia, who had suffered from religious persecution, famine and civil wars. Yet, when they arrived in Israel, these distinctive people faced appalling discrimination, racism and a lack of empathy for their hardships in Ethiopia and during their journey to Israel. Moreover, this was exacerbated by a mixture of bureaucratic insensitivity and incompetence. The uncharacteristic violence, seen recently during demonstrations by members of the Ethiopian community in Israel, was a direct result of years of accumulated frustration against the state and especially the police. The unprovoked beating up by policemen of Demas Fekadeh, an Ethiopian Israeli soldier in uniform, could well serve as a much necessary wake-up call for Israeli society to change, quickly and radically, its treatment of the 130,000 Israeli citizens and their descendants who immigrated from Ethiopia. The main challenge in tracing the origins of a Jewish presence in Ethiopia is the lack of reliable accounts. Consequently there are several versions regarding the origins of the Ethiopian Jews or, as they are historically known, Beta Israel (House of Israel). One school of thought claims that Ethiopian Jews are descendants of the lost Hebrew Dan tribe. An alternative explanation asserts that the Beta Israel community may be the descendants of the entourage that accompanied Menelik I, the son of King Solomon and Queen Sheba. Finally, leaders from within the community argue that Ethiopian Jews are descendants of Jews who left the conquered Kingdom of Judah for Egypt following the destruction of the First Temple in 586BC. For centuries, until the 20th Century, Ethiopian Jews were completely isolated from Jewish communities in other parts of the world. Yet, they adhered to biblical Judaism for many centuries. How did they arrive in Israel? It was Prime Minister Menachem Begin, after he came to power in 1977, who first opened the country to Ethiopian Jews. It was in response to the threat to the community from famine, political unrest and the hostility of the self-proclaimed Marxist-Leninist regime led by Col Mengistu Haile Mariam. Initially the Israeli secret service Mossad organised their immigration through refugee camps in Sudan. This resulted in the arrival of about 7,000 Ethiopian Jews in Israel. In later years, Israeli security services embarked on even more daring operations, code-named Operation Moses (1984-1985) and Operation Solomon (1991), which rescued a further 20,000 Jews. With the end of Mengistu's regime it became easier for Jews to emigrate from Ethiopia and, by the end of the 1990s, about 90,000 of the Beta Israel community had arrived in Israel. What are the root causes of tensions? Only 30 years after the arrival of the first Ethiopian Jews to Israel, and following recent violent clashes with the police, there is a broad acknowledgement that the state failed appallingly in absorbing the Jewish Ethiopian community. To begin with, there was a lack of empathy in Israeli society for the hardships involved in leaving behind homes, relatives and friends who could not make the journey; not to mention the loss of family members and friends on the hazardous journey. Upon their arrival in the Jewish state they met the inherent Israeli paradoxes involved in absorbing Jewish immigrants. They were welcomed and granted the basic needs of accommodation, healthcare, education and general welfare. However, this was done without sensitivity to their specific conditions and from the outset they faced discrimination and racism from the Israeli establishment. Many in the religious establishment even dared to question their Judaism. One of the early incidents that exposed this approach was the revelation in the 1990s that the Israeli national blood bank had routinely destroyed blood donated by Ethiopian Israelis for fear of HIV. It sent a message of exclusion from the rest of the Israeli society. The failure to absorb the Ethiopian Jews is the failure to fully and genuinely integrate them into Israeli society. For instance, while Ethiopian Israeli schoolchildren comprise only 2% of Israeli pupils, most of them study at schools that are predominantly Ethiopian. Worse still, their attainment in school is much poorer than the general population, which blocks their path to academic success. Many of the Ethiopian Israelis live in the periphery of society that already grapples with issues of unemployment and scarce public resources. This makes it more difficult for them to integrate and causes friction with the more veteran population. Ethiopian Jews suffer from the highest poverty rate among the Jews in Israel, and suffer much higher levels of police stop-search, arrests and incarceration. 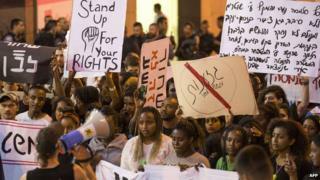 It was the cycle of discrimination, racism, poverty, hopelessness and higher levels of law breaking that led to the recent clashes in the streets of Israeli cities, between Ethiopian Israelis and the police. This challenges Israel to look in the mirror and correct the way it treats a vulnerable segment of the population within its own society.